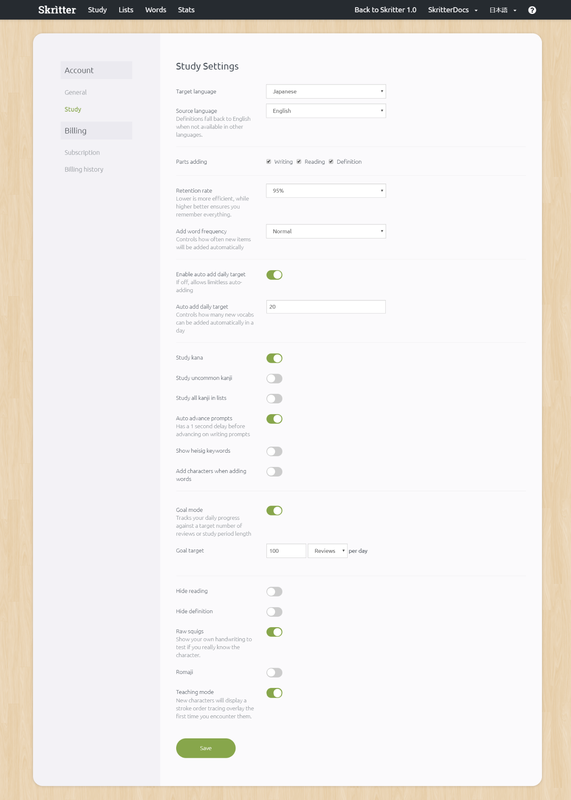 Adjust various study settings to optimize how you would like to study. The study settings screen is where you can change more permanent study settings, like source language, (opposed to the Quick Settings available on the study screen). Include Heisig keywords: Enable or disable Heisig keywords from displaying in definitions. Also add characters when adding words: Enable to add single characters from multiple character words as their own entry when multiple character words are added. When finished, make sure to tap Save to confirm any changes. Target language: Choose which language you would like to study. Source language: Choose the language used for definitions. Parts studying: Select / Deselect which prompt types you would like to study. Study kana: Enable or disable kana handwriting for writing prompts. Study uncommon kanji: Enable or disable uncommon kanji writings. When enabled, all word entries will present writing prompts, even those marked as uncommon such as 硝子 or 成程, (where they are usually written ガラス and なるほど）. 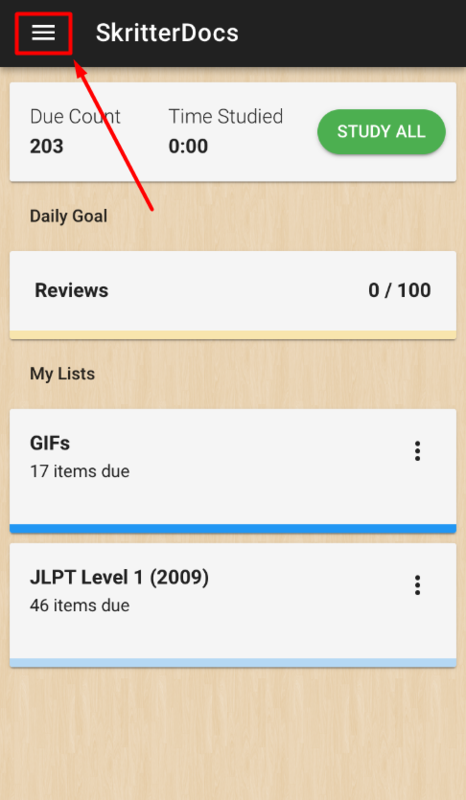 When disabled, uncommon entries will only present reading and definition prompts. Style: Choose which character styles you would like to study, (traditional, simplified, or both). Parts: Enable which parts you would like to study. Changing the setting here (versus the study screen) is a more permanent setting. Retention Rate: Adjusting the retention rate affects how many prompts will be scheduled. The lower the target retention rate, the less reviews will be generated, however at the expense of your retention. 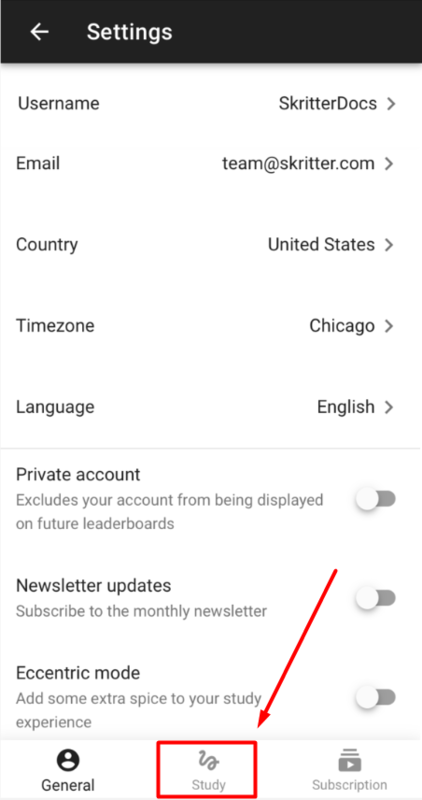 If in question, it's best to leave this setting at the default target retention rate (95%). 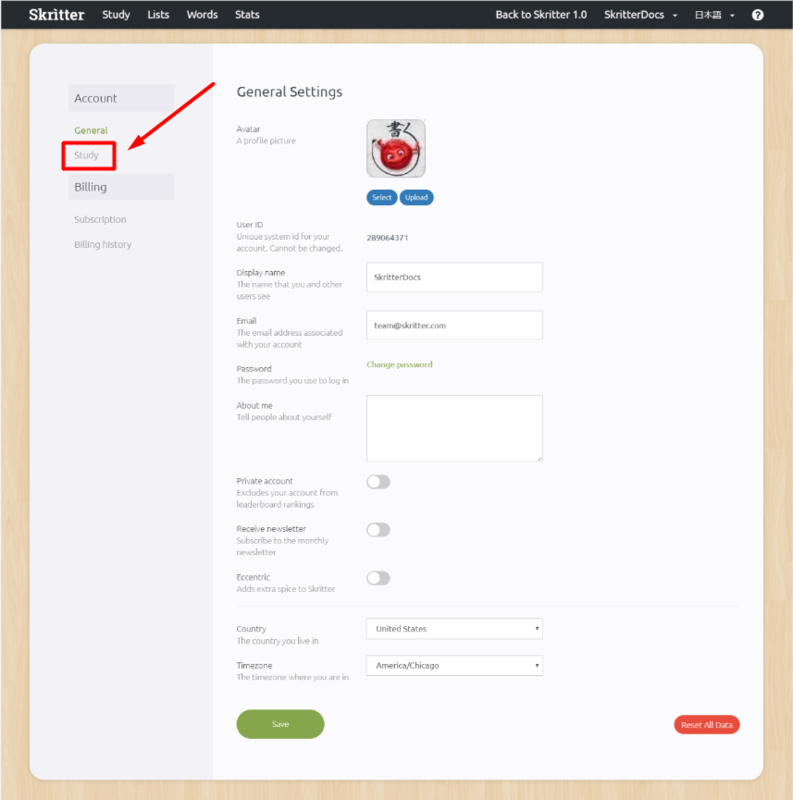 Add Frequency: Adjusting the "add frequency" setting will affect how fast Skritter automatically adds new words as you study. 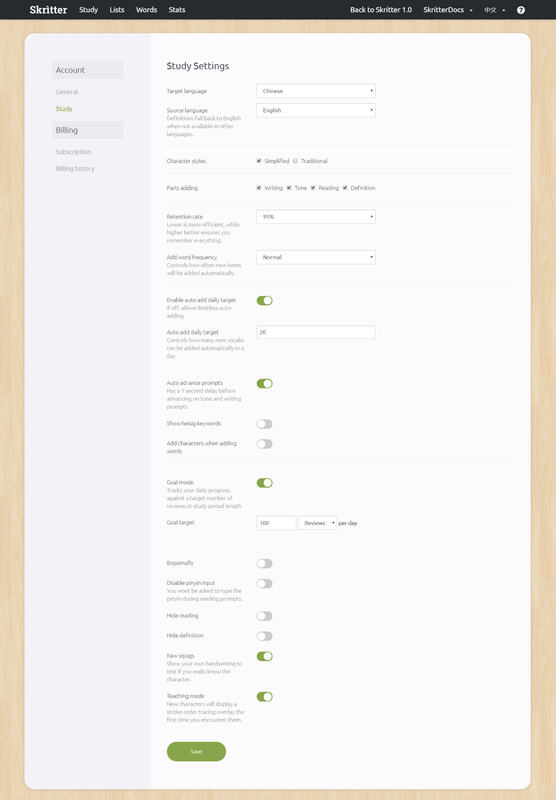 Auto Advance: Enable or disable auto advance. 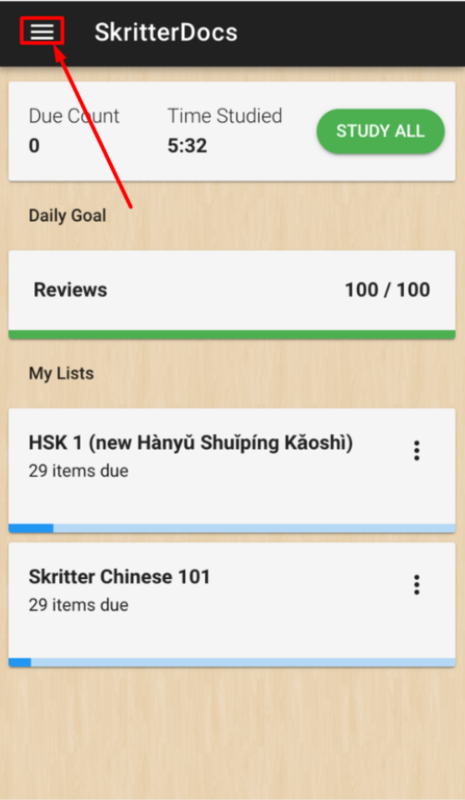 Bopomofo: Enabling the Bopomofo option will display zhuyin (bopomofo) instead of pinyin. Hide Definition: Enabling the "hide definition" option will hide the definition on any unanswered prompt. You can tap "reveal" at any time to reveal the definition, and it's automatically revealed when the prompt has been finished. Hide Reading: Enabling the "hide reading" option will hide the reading n any unanswered prompt. You can tap "reveal" at any time to reveal the definition, and it's automatically revealed when the prompt has been finished. Raw Squigs: Enabling the "raw squigs" option will show your own handwriting, instead of each stroke being replaced with Skritter's. Once finished writing, your handwriting will be compared against Skritter's font. 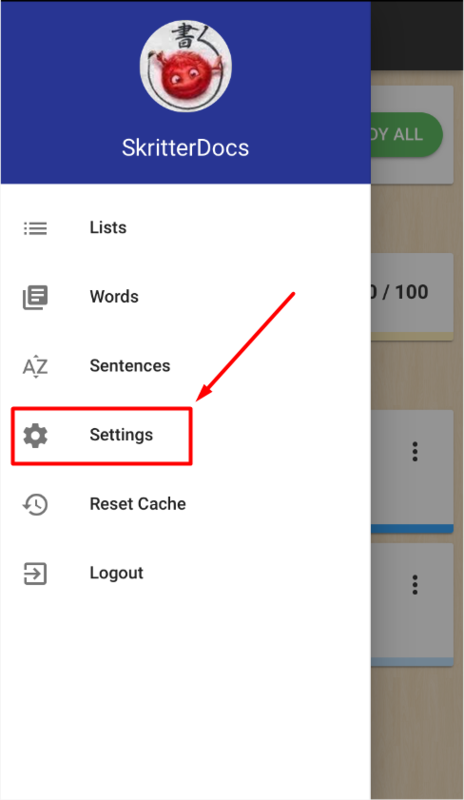 Teaching Mode: Enabling the "teaching mode" option will automatically guide you through new words or characters added stroke by stroke. Easing Speed: Rate at which strokes snap to canvas position. Easing Type: Style of strokes aligning to canvas position. Heisig Keywords: Heisig keywords are used in the popular Remembering the Kanji (RTK) series by James Heisig.